At Mahoney’s, you stake your own table and wait. And, wait. And wait. And wait. They take their time making po’boys here. Having just experienced the machine-like efficiency of the Parkway Bakery & Tavern, our half-hour wait at Mahoney’s seemed like an unreasonably long time. We thought they forgot our order. But in all other respects, this is one instance where the consensus seems to have gotten it right: Mahoney’s Po’Boy Shop makes good po’boys. I haven’t had nearly enough po’boys to declare theirs the best po’boys in New Orleans*, but the two we tried were both very good. Mahoney’s wasn’t the most practical sequel to our two-part po’boy crawl (from the Parkway Bakery & Tavern, we had to taxi across town to Magazine Street), but we were thankful for the extra time to digest. Arriving quite full and staring down a predictably large meal that evening, the five of us split two 6-inch po’boys (they also sell them in 12 and 30-inch sizes). Although we were tempted by the many delicious-sounding and creative po’boys on the menu (cochon de lait with Creole slaw; fried chicken livers and Creole slaw; cheese liver; and French fries, roast beef & cheddar cheese), we chose the two most traditional ones, the “Oyster and Remoulade Po’Boy” and the “Roast Beef & Gravy Po’Boy.” Iggy also ordered a side of fried green tomatoes to share with Houston. 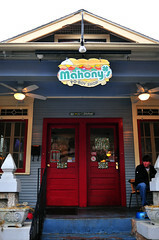 Like Parkway, Mahoney’s resides in a converted house. With a nice little porch and a cheerful sign, it’scute. The inside is modest – essentially a one-room outfit with a bar to one side, it’s nothing like the labryinthine Parkway. Orders are made and paid for at the register. Food and drinks are delivered to your table by roving servers calling out names. When we walked in, we had noticed a few people sitting on the benches at the front consumed by the paper, lost in their hand-held devices, and craning their necks to see the game on the tube. I thought they were waiting for friends. Then I noticed them slowly thin out over the course of our meal, disappearing out the door with sacks. I realized that they were walk-in take-away orders. I noticed that one gentleman who left with us had already been waiting when we walked in, about an hour earlier. I’m not sure the po’boys here are worth that kind of wait (remember, this coming from an impatient Midwesterner). But they were very good. The “Oyster and Remoulade Po’boy” was my favorite of the two we tried ($9.25). The oysters were fat, encased in a crunchy shell. The remoulade, however, was the real joy – creamy and zippy, it gave the sandwich a bright zing. I don’t recall there being the usual vegetable garnishes in this sandwich other than the remoulade. The “Roast Beef & Gravy Po’Boy” was also very good. I preferred this one to the one at Parkway ($6.75). Whereas the meat in the Parkway sandwich was pulpy and mushy, the beef here came in thick, ropey strands and pieces. More important, the gravy here was more flavorful, having an honest, hearty, and beefy flavor. Garnished with some shredded lettuce, tomatoes, and mayonnaise, it was delicious. The fried green tomatoes never showed up. 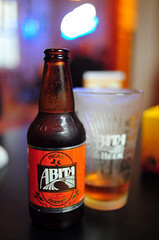 We had ordered a couple of beers and were left chatting over a last few bites of our po’boys when I went back to the register to check on the tomatoes. The woman reminded us that the wait could be up to an hour for food. None of my friends remembered her telling us that, and I didn’t either. As we were nearly finished and ready to go, we canceled the order. The owner’s (Ben Wick) grandmother, a tiny Japanese lady who buses tables in the restaurant, took a particularly keen interest in our table. Over the course of our long wait (she seemed to have no sway with the kitchen), she told us animated stories about her immigration into the U.S. fifty years ago and pulled out what amounted to a family album from her apron – pictures of her children, grandchildren, and her great-grandchildren. A wee little thing, she was cute as a button and full of energy which I wish she could put toward helping them speed up the po’boy production in the kitchen. A couple of local regulars at a nearby table told us that the thing to do is to call in your order ahead. I’ll pass that recommendation on to you: call ahead, the wait might kill you. 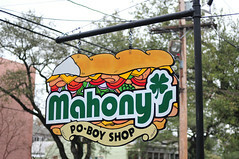 * Mahoney’s has won two New Orleans Po’Boy Preservation Festival titles. In 2008, its “Peacemaker” (fried oysters, bacon, and cheddar cheese) won the “Best Classic Fried Po’Boy” category. 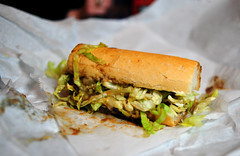 In 2009, its “Fried Chicken Liver and Creole Slaw” po’boy won the “Best Specialty Po’Boy, Non-Seafood” category. ~ by ulterior epicure on February 5, 2010.